Home / People / Doniree Walker / Blogs / Pinot Gris/Grigio 101: What's the Difference? 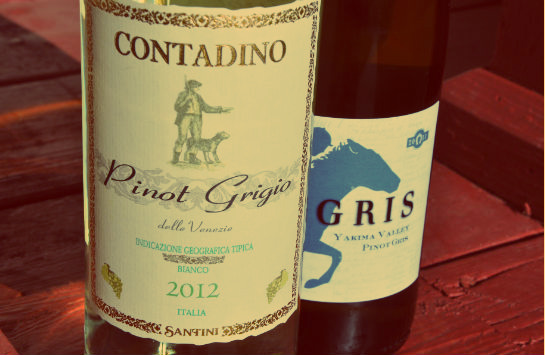 Define the Wine | Pinot Gris vs. Pinot Grigio -- What's the Difference? Ha! That's a trick question. It's the same grape! By definition, there is no difference between Pinot Gris and Pinot Grigio. However, the two names reflect different styles of wine based on regions, climates, and winemaking. More on that shortly, when we get into the geography of the Pinot Gris/Grigio grapes. The word Pinot is the French word for "pine cone," and Gris means grey. This all makes sense, considering the grapes grow in pine cone-shaped clusters and are often grey in color. Grape-ography | Where Can I Find Some? While the grape originated in France (known there as Pinot Gris), it found its fame and recognition thanks to its Italian neighbors, where they call it Pinot Grigio. It is now planted all over the world just about anywhere wine is grown. While there are regions that focus more on the Pinot Gris style (Oregon, California, and New Zealand, for instance), Pinot Grigio is more commonly grown in every wine-making region. It is easy-drinking and meant to be enjoyed early (not cellared). The Pinot Grigio grapes and wines reflect an Italian style that is typically lighter, crisper, fresher, and fruitier than its Alsace cousin, Pinot Gris, which tends to be fuller, richer, and spicier versions of the grape. Because its a bit heartier, Pinot Gris is a much better option if you're interested in cellaring and/or aging the wine, as Pinot Grigio wouldn't hold up for quite as long. Pinot Grigio is well-suited to lighter dishes (being the lighter of the two options) such as seafood like shrimp, scallops, and fish, or light appetizers like cheese plates, crudités, and fruit. Since Pinot Gris is richer, it stands up nicely to heartier cuisine such as stews, roasts, casseroles, spicy dishes, and hard cheeses.